On April 13, 1957, the Boy Scouts of Lafayette presented a pantomime “Lafayette in Retrospect” at the Boy Scout Circus at the Colorado University Fieldhouse in Boulder. Because of the significant historical importance to those who are familiar with the background of Lafayette, and to those of us who are interested to know about it, space is being given to record in full, the text of “Lafayette in Retrospect” as it was produced in Pantomime by the Boy Scouts in keeping with the Scout-orama “History of Colorado” theme for this year. The Boy Scout Mothers organized themselves into a research team who collected the material. Richard Purdy did much of the interviewing. Mayor Dinsmore used this historical source material as author of “Lafayette in Retrospect”. Our tale (of tonight) begins with Lafayette Miller, who with his wife, Mary, left Iowa the first day of June, 1863, westward bound and, presumably without thought that one day his name would be preserved in perpetuity. Almost three months they pressed forward on their trek with covered wagon and oxen and on August 19 came to Burlington Trading Post, now familiarly known to all of us as Longmont. Of the Miller’s next eight years at the trading post, no record seems extant. We lose sight of them until 1871 when Lafayette Miller filed on a homestead which was situated where is now almost all the land of the Town of Lafayette lying east of U.S. Highway 187, or Public Road as it is called locally. There at the southernmost reach the Millers built their home. There, too, were born to them seven children of whom five survived to maturity. Along about the time Lafayette Miller was settling to farm his newly acquired land, others were discovering that which was to determine Lafayette’s economic destiny for the next three quarters of a century, coal. It seemed that the entire Boulder Valley was underlain with rich deposits of bituminous coal. Soon tipples rose into a veritable skyline all around Louisville, Marshall and Erie. In 1887 three brothers, John, James and William Simpson put down one of the greatest coal producing mines of Colorado, the famed Simpson or Cannon Mine. The coal they dug may truly be called the history of the Town of Lafayette. Now, in the interest of chronological order, we leave the coal miners to their tasks, later to regard them again for they and the coal they dug may truly be called the history of the Town of Lafayette, that without which it is unlikely we would be here tonight. Education came to Lafayette in 1888 when the first school was opened on Hathaway Row, now East Cleveland street. A Mrs. Scott, that first year, taught 24 pupils, eight of whom still live. 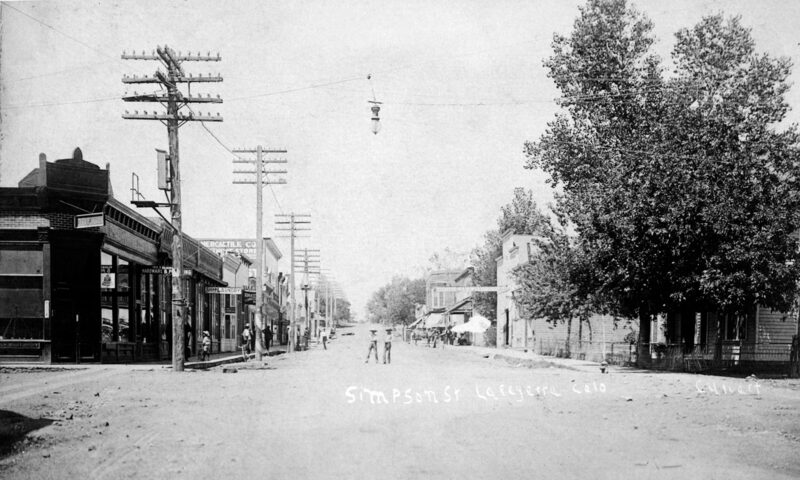 The following spring, April 20, the first child, a girl who is still living, was born in Lafayette to Joseph and Lydia Simpson in a house on Simpson Row. Mrs. Ena Simpson Jones still lives in Lafayette. August of the same year, the second native of the town, this time a boy, entered on the scene. He was the son of William and Mary Anne Liley and was called Charles. We find a touch of irony in that the first boy born in Lafayette would grow up to own and operate the last coal mine in Boulder County, the Black Diamond Mine on U.S. Highway 287 at Baseline Road, now in the process of dismantling. Lafayette Miller died in 1879, and in his memory his widow deeded a major part of the homestead land as the site for a town to bear his given name. Eighteen-ninety was an eventful year in Lafayette. In January the town was incorporated, and a son of Lafayette, Thomas Miller, was elected its first mayor. Later that year a postoffice was established with a Mary Jane Scott as postmistress. But one event of, perhaps, more significance than any other took place in 1890; the first labor union of coal miners was organized and John Cassidy was to be its first president. A decade hence this event was to culminate in unjustifiable tragedy. The next year a weekly newspaper, published continuously ever since, was first printed by a Ray Hale, editor. From 1900 to 1910 things in Lafayette moved along in tranquil tenor. Then struck catastrophe that, even now, several generations later, is not completely forgotten: the Great Coal Strike. The strike lasted five long and embittered years, and well nigh brought about the utter undoing of Lafayette as a municipality. But our townspeople were a hardy lot. The strike settled, they, against almost insurmountable odds, rebuilt what strangers had invaded, destroyed and deserted. Between the first census taken in 1918 and the most recent, in 1950, Lafayette had grown in population from 1,800 to 2,073. Normal growth and annexation are estimated to have now increased the count to over 3,000. Our schools have an enrollment of 680. Present mayor is Clarence Dinsmore. The town of Lafayette grew from a polyglot population to send more of its sons per capita into the armed services in World War II than any other community in the United States. Scout Troop 79 of Lafayette, founded in 1922, is proud and grateful to be a part of Boulder County with its exemplary governmental administration, excellent educational environment, and is appreciative of the opportunity it has been given to tell the story of Lafayette.